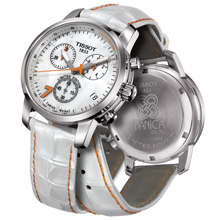 As sponsor of the #7 Tissot Chevrolet owned by Junior Motorsports in the NASCAR Nationwide Series, Tissot presents a timely tribute in the form of the Tissot PRC 200 Danica Patrick Limited Edition 2011. Prominently featuring the number seven and orange color scheme elements from the car, the new watch series consists of 4,999 pieces. It is eye-catching and elegant in equal measures, with 20 Top Wesselton diamonds glimmering from its face. Intrinsic precision and robustness, are rounded off by feminine accents such as a mother-of-pearl dial and matching strap with a mother-of-pearl effect. 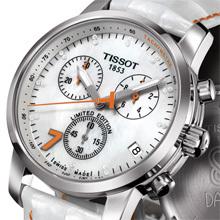 The Tissot PRC 200 Danica Patrick Limited Edition 2011 is a high-performance chronograph. True to the letters that make up its name, this watch is precise, robust and a genuine classic. These characteristics find expression in features such as a screw-down crown and water resistance to 20 bar (200 metres / 660 feet). Its main dial and counters have fine markings, reminiscent of racing car dashboard design. The orange accents, as seen in the colors of her car add dynamism to some of the intervals, the second hand and the hands on two of the chronograph discs. The slender case, finely grooved crown and glistening white strap add feminine charm to the energy associated with high speeds and intricate manoeuvres on the track. Danica Patrick’s lucky number seven stands out boldly in orange on the dial, balanced by the date display at 4 o’clock, while the number of each specific watch is marked on the case back together with the driver’s logo. This watch is geared to active women who view multi-tasking as part of the ride. Danica Patrick is the ideal role model for this philosophy with her multi-faceted list of achievements and talents.